What better time could there be for Scotland's only offshore commercial radio station to make its debut than on Hogmanay? It almost didn't make it due to bad weather as it was towed up the east coast to drop anchor off Dunbar, East Lothian on New Year's Eve, 1965. Transmissions soon began from the Comet, an ex-Irish lightship built on the Clyde, and Radio Scotland brought in the New Year of 1966 in style, quickly establishing it as a firm favourite with the listeners. The station had a "homely" sound and had an uncanny knack of providing exactly what people wanted to hear, perhaps due to the fact that it was run by local people for local people. The frequency was 242 metres, 1241 kHz, but was later moved to 1259 kHz, still keeping the "242" tag. When it was realised that reception was poor in the highly industrialised and populated west of Scotland, the ship was towed for 1000 miles round the north of Scotland to a new anchorage off Troon in Ayrshire. The journey was fraught with difficulties and hampered by severe weather, and, as well as the signal in the east now suffering, it became apparent that the station was in fact broadcasting from within territorial waters, resulting in a court case and a fine of £80. 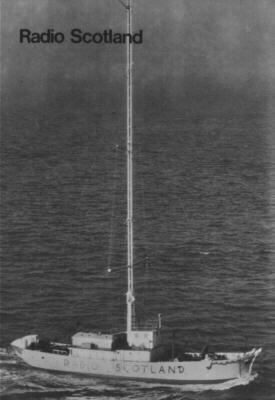 It then moved to a point off Ballywalter, County Down in Northern Ireland and was renamed "Radio Scotland and Ireland", and shortly after was towed all the way back round to drop anchor off Crail in the East Neuk of Fife, making it probably the most travelled offshore station ever! Radio Scotland had its own monthly magazine called "242" and also had a fan club called the "242 Clan". The station held "Clan Balls" at venues all over the east and west featuring DJs from the ship and top groups and artists. The station closed down at midnight on 14/8/67 - immediately before the British Marine Etc. Broadcasting Offences Act came into force.